KING-PIN-LESS PLEASE CALL FOR PRICING. Side Locking Brake: Additional $7.60. Swivel or Rigid. 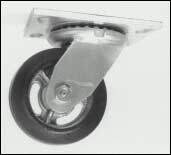 Tread Lock Brake now available: $10.00 per swivel casters only. Swivel Locks: Add $10.00 to SWIVEL caster price.